Harvest Gold Memories: Vicki Lawrence Re-Emerges on TV as Margaret on "The Cool Kids"
Vicki Lawrence Re-Emerges on TV as Margaret on "The Cool Kids"
A while back, I shared in a post (see HERE) I did about the "Dead Celebrities Cookbook" (and its sequel "Christmas in Tinseltown"), mentioning that I visited Vicki Lawrence's personal website after buying the DVD set of "Mama's Family", where I encountered a recipe which she shared from another dead celebrity: the late Dinah Shore. The recipe was good, but comedienne and actress Vicki Lawrence is on another career high as of late. She stars as the character Margaret in the new sitcom on Fox television (the broadcast network now owned by Disney) called "The Cool Kids" which premiered in September 2018. 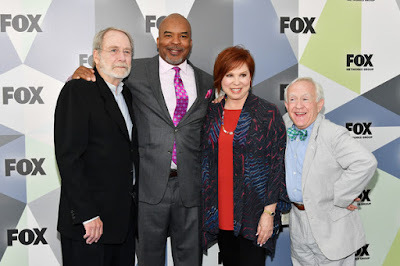 The series co-stars Martin Mull, David Alan Grier and Leslie Jordan. "The Cool Kids" follows three male senior citizen friends at Shady Meadows Retirement Community (a joke on the show was that Allison, the head of Shady Meadows Retirement Community told the residents that they were in Shady Meadows voluntarily, to which they responded "We are? Our kids never told us that!") who are the top dogs until they're blown out of the water by the newest member of the community, a female rebel named Margaret who's ready to challenge their place – it's kind of like high school, only with 70-somethings. In case you hadn't guessed it, the female rebel is played by Vicki Lawrence (age 69 as of 2018). The cast of "The Cool Kids": Martin Mull, David Alan Grier, Vicki Lawrence, and Leslie Jordan at the 2018 Fox Network Upfront at Wollman Rink, Central Park on May 14, 2018 in New York City. "The Cool Kids" turned into a sleeper-hit for the Fox broadcast television network, opening to impressive ratings drawing over 9 million viewers, making it the most-watched new series launch on Fox since "New Girl" debuted back in 2011. That initial success prompted the network to order a full season for the show after its trial run. Vicki Lawrence told the entertainment magazine Vulture that "They were casting this right when we were doing the 50th anniversary of the Burnett reunion. I didn't want to go [to the audition], because I just wanted to go over to CBS and see Carol, hang out, see all my old friends, and visit with all the cool guest stars she was gonna have on there. I could not be bothered. My agent kept calling me saying, 'But this is perfect for you!' And I went, 'It's cute, but really, I'm so tired of going to auditions.'" Of course, she was ultimately persuaded to join the cast. Aside from Vicki Lawrence's 11-season tenure on the ever-popular "The Carol Burnett Show", she has surprisingly few television credits to her name except for the long-running spin-off from that show called "Mama's Family" (I wrote about "Mama's Family" HERE) which ran for six seasons over a seven-year period. That show was produced by Joe Hamilton and began on network television, but was taken off the air after a two season run on NBC, but was subsequently rebooted even more successfully in syndication with a number of modifications, running for six seasons from 1983-90. Vicki was just age 24 when she first played the abrasive, Southern senior citizen matriarch character of Thelma Mae Crowley Harper, better known as simply Mama, which first emerged on "The Carol Burnett Show" back in 1974. "The Family" as it became known on "The Carol Burnett Show" was so consistently popular that it became one of the recurring skits to endure on the Burnett Show. In "The Family", Carol Burnett played the main character of Eunice Harper Higgins (an emotionally-needy character who often goes off on rants about her lot in life), while Harvey Korman played Eunice's husband Ed Higgins; Betty White occasionally played Eunice's snobby older sister Ellen Harper-Jackson (at least in a few episodes both on "The Carol Burnett Show", as well as on the network television run for the spin-off) along with guest-stars such Roddy McDowall (who portrayed brother Phillip in nearly as many episodes of "The Family" as Betty White did the character Ellen, although Betty White played in both "The Carol Burnett Show" and the network run of "Mama's Family"), Tom Smothers, Alan Alda, William Conrad, Jim Nabors, Maggie Smith, Joanne Woodward, Madeline Kahn, Chuck Barris, Jaye P. Morgan, Jamie Farr, Allen Ludden and Craig Richard Nelson. Anyway, with her latest character Margaret on "The Cook Kids", Vicki Lawrence plays a character who not only appears much younger than Thelma Harper, but also behaves younger. Indeed, the entire show challenges the notion of aging. 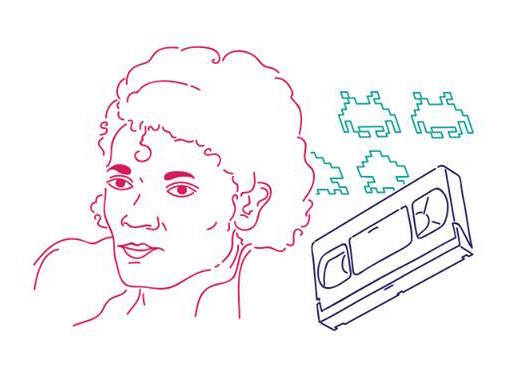 In many respects, the series is similar to the way in which "The Golden Girls" upended traditional television depictions of aging, representing characters who were vibrant, and not requiring a young character to carry the show. When producer Charlie Day pitched "The Cool Kids", he said that Fox pressed him to inexplicably include a younger character in the main cast. "I said, 'That's ridiculous.' Young [viewers] can relate to older characters. Don't make me force in a young character that doesn't fit. And they were kind enough to relent to my yelling." "Could Hollywood's next movement be #AgeismToo? Consider this: 'The Golden Girls' (which I blogged about HERE), that classic sitcom centered on three 60-something women and one feisty octogenarian, was a Top 10 ratings hit for six of its seven seasons (1985-92). But it's still taken 26 years for mainstream network honchos — at youth-obsessed Fox, no less — to deliver another comedy strictly focused on seasoned types." "We tested really well with the younger audience. Because God knows, they love to laugh at their grandparents. And yeah, I knew many young people that were in love with 'The Golden Girls'. The young audience loved 'Mama's Family'. When I first started doing my road show, I assumed that my audience was gonna be an older crowd from the Burnett Show, and I was really surprised by the fact that so many young people showed up." Truth be told, the sitcom "Mama's Family" did much better with younger audiences in its resurrection in syndication. Part of the reason was because NBC repeatedly changed the time-slot for the show in during its initial network run, making it difficult for fans to find it on television. Among the other key changes in its successful syndicated resurrection were a closer focus on just a few cast members; several left the show (or were never permanent cast members to begin with) in order to join (perhaps not surprisingly) "The Golden Girls". Notably, Rue McClanahan left the role as Fran Harper on "Mama's Family" to permanently play Blanche Devereaux on "The Golden Girls" and Betty White who was only a guest star as Ellen Harper-Jackson on "Mama's Family" also joined "The Golden Girls" as a permanent cast member on "The Golden Girls" who played Rose Nylund on that show. "Mama's Family" aired around the same period as "The Golden Girls", managed to draw many of the same viewers (particularly among younger and gay audiences). Other changes to the resurrected "Mama's Family" was a new set, the elimination of the two of characters who were Vinton Harper's two children with his first wife Mitzi (a character never seen on the show), and replacing them with one younger character who was sister Eunice Harper Higgins' son Bubba Higgins. The character Bubba was a key reason the resurrected show did so well in syndication (the time slot where it frequently ran in syndication was another, typically airing early evenings around 7:00 or 7:30 PM). Bubba was played by the buff, ginger actor Allan Kayser. The character of Bubba Higgins always wore extremely tight-fitting jeans, and numerous teenage girls (and gay boys) watched the show mainly to see Bubba and the bulge in his tight-fitting jeans as eye-candy. The other important new character in the resurrection was that of neighbor Iola Boylen played by actress Beverly Archer, who was central to many plots. The character of Iola was a regular in the reboot. Iola was the neighbor and best friend of Thelma, who was written into the show as a replacement for deceased Aunt Fran. Iola is an old maid/spinster who is the same age Naomi, whom she is jealous of for her marriage to Vinton. She is known for being able to knit little trinkets out of dryer lint, and other assorted "crafts", as well as her domestic cooking skills. 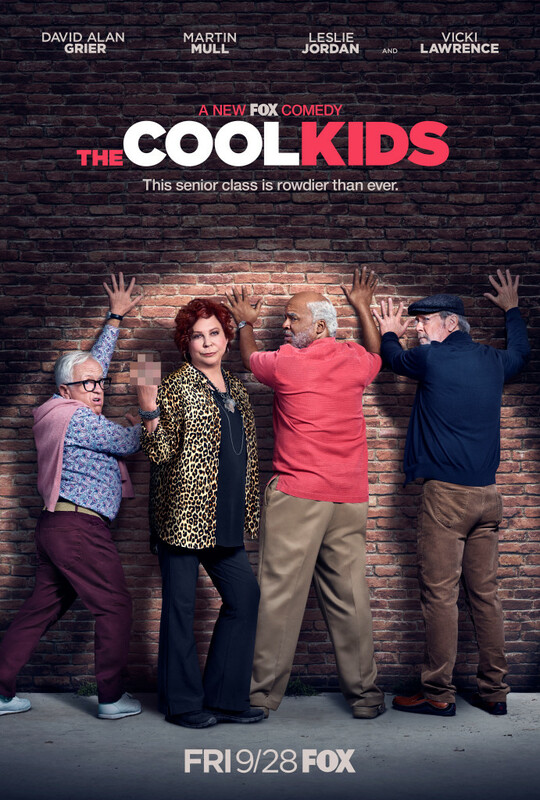 By comparison, "The Cool Kids" is a bit crass (by design), and it is also a bit braver with its main characters than "The Golden Girls" was, with a core cast consisting of both men and women (including Vicki Lawrence and her castmates who are men: Martin Mull, David Alan Grier and Leslie Jordan), caucasian and black (David Alan Grier is the black character best known for his work on the early-1990's Fox television hit "In Living Color", and on that show, one of his recurring characters was a skit the show called "Men on Film" where he plays an effeminate, gay, black man named Antoine Merriweather), as well as straight and gay (Leslie Jordan's character is gay, just as the actor himself is in real life) characters. To a large extent, the cast resemble their characters. In many ways, this also reflects broader changes in American society, and although "The Golden Girls" fearlessly addressed most of those issues, they weren't part of the show's core cast. While "The Cool Kids" isn't quite a "Golden Girls" reboot it comes pretty close. AARP noted "Kids may not yet handle its inevitable jokes about irregularity and, yes, Alzheimer's disease with the finesse of The Golden Girls, but it's heartening to know that the show refuses to treat its characters like doddering fools. The show is less William Shatner in 2010's flop $#*! My Dad Says, thank goodness, and more Betty White as Elsa in Hot in Cleveland." In the end, success for "The Cool Kids" may teach the lessons "The Golden Girls" should have taught television thirty-five years ago, but they simply did not remember. To some extent, as Vicki Lawrence acknowledged, networks aren't run by old guys in suits anymore. She says "They're just young and adorable." Maybe they are, but the networks are still struggling. Today they compete not only with cable, but with streaming services (both paid and free). The explosion in content has changed what we think of as television. Vicki Lawrence acknowledged that in her Vulture interview. Well, everybody's going everywhere. We had that whole meeting with all those people. I’m like, "You're from what, now? What in the hell is Roku?" Then after this meeting, we did these promos: "If you missed The Cool Kids on Fox, don’t forget to check us out on Netflix. Don't forget to check us out on iTunes. Don’t forget to check us out on Roku. Don’t forget to…" At the end of the meeting, I said, “I’ve got a question. How in the hell do you do the ratings anymore?" They said, "Oh, it's very complicated and very different." Television is not like television was at all, anymore. She's not kidding on that! You can have a look at the preview for "The Cool Kids" below, or by visiting https://youtu.be/T1-lhUD9YfE. That's followed in the playlist below with an interview by The Paley Center for Media in September 2018 with "The Cool Kids" producer Charlie Day and the cast of "The Cool Kids". That interview can be seen in the playlist below, or by visiting https://youtu.be/wJb5ziNYsas. I've created a shortcut for the entire playlist which can be visited directly at https://tinyurl.com/y27ns6ey. As for watching "The Cool Kids", it runs on Friday evenings on Fox broadcast television, or it can be viewed on demand (typically free) on most digital cable systems, or even streaming directly on Fox television's YouTube https://www.youtube.com/playlist?list=EL8p86Z2CBJH-mhmqfMNhcBQ channel, or on other digital channels, including Fox's website for the show at https://www.fox.com/the-cool-kids/. On December 2, 2018, there was the sad news that actor/dancer Ken Berry had passed away at age 85 (see the obituary at https://www.usatoday.com/story/life/people/2018/12/02/ken-berry-star-f-troop-mamas-family-has-died/2183492002/ for details). Ken Berry played the dim-whitted son Vinton Harper on the hit syndicated sitcom (which was initially a network show) that Vicki did with Ken known as "Mama's Family" for six seasons after its 1983 debut. Vicki Lawrence herself acknowledged his passing on her Instagram feed https://www.instagram.com/p/Bq5eVoelrOC/ In addition to his appearances on "Mama's Family", the "F-Troop", Ken Berry was also a frequent guest star on many TV shows, game shows, daytime talk shows, etc. He also did a television commercial for the now-defunct seventies national shoe retailer known as Kinney Shoes which can be seen at https://youtu.be/h8aAFHhaIKc which is a great demonstration as his less-appreciated skill as a dancer. R.I.P. Ken Berry.